I've seen a few articles on Bitcoin floating around lately with a misleading headline, variations of "Bitcoin's price decline is being blamed on the moon." When you read into the articles, they admit that what they really mean is that Bitcoin is in a price decline that has occurred just about every year at this time, coinciding with the coming Chinese Lunar New Year. This is a major holiday in China, and just like any major holiday anywhere in the world, lots of money gets spent. Since there are nearly 1.4 billion Chinese living in China at this point, that's a lot of economic activity in a short period of time, enough to shake global markets. Bitcoin is no exception to that; with many the world over having racked up massive gains in 2017, putting Bitcoin on the selling block to lock in those gains when it's time to spend some money makes sense. There's one other global commodity that factors heavily into the Lunar New Year celebrations: gold. Every year, traders around the world start watching gold for signs of Lunar New Year buying, as gold is a popular choice for gifts that will be exchanged during the festivities. I went with a simple closing price line chart for each commodity, just to make this easy to see. 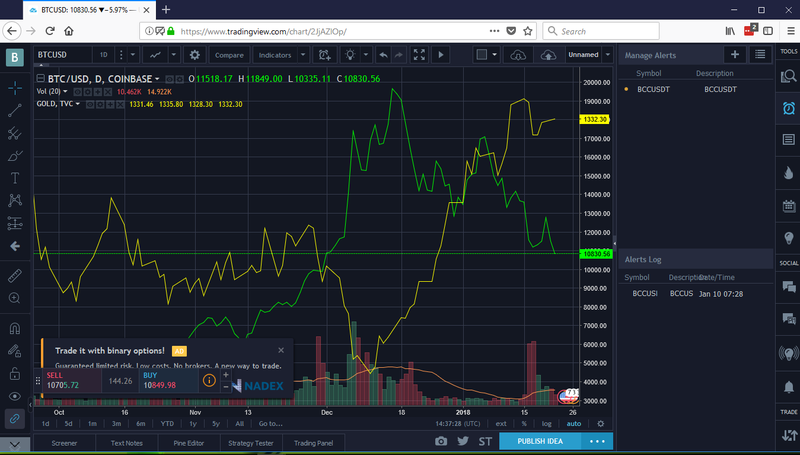 Bitcoin, with data drawn from Coinbase, is the green line, while gold is the yellow line (of course). As you can see, gold bottomed on December 11th, a Monday, and from there entered a dramatic upswing that continues right now. Bitcoin peaked a few days later on the 16th, and then began its present decline. They ran in parallel briefly at the end of December, but then on January 8th, another Monday, they parted ways. Can the Lunar New Year explain all of this? No, it can't. Silver shows the exact same pattern as gold during the time frame displayed when overlaid on the chart, which could factor in to the festivities in the form of gifts. However, oil locks into the chart in line with gold, and I highly doubt that Chinese are giving each other barrels of oil as gifts. But as a cultural trigger for a temporary rotation out of Bitcoin and at least in part into other commodities, coming from a simply massive culture, I think the Lunar New Year can be credited with that trend in and of itself, as this has been the case in years prior. What to do with this? That's up to you. I know a lot of people are hitting the "sell" button and heading for the hills. The haters are ensuring that there's no shortage of FUD being printed out there that is based on the price action only, completely devoid of context. All the same, that inspires people to flee. As for me, I really hate paying capital gains taxes, and even after these declines I would end up paying tons of taxes if I were to liquidate at this level (I got into Bitcoin relatively early). I'm just going to keep building up my holding of Hashflare mining contracts for the time being. 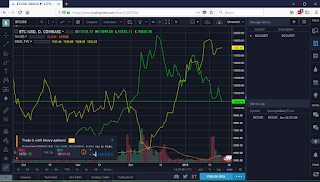 I find them to be a relatively cheap way to get in on Bitcoin production, which in this "falling knife" environment might be a more attractive prospect than buying and HODLing Bitcoin directly at this time. The cost of the contracts is fixed, the Bitcoin generated from them can be automatically reinvested back into more hashing power, and the dripping of newly mined Bitcoin into my wallet daily could result in some very nice dollar cost averaging as prices move from lows back to highs at some point.